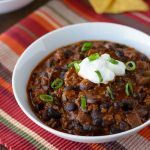 This Chili con Carne recipe is a classic Tex-Mex dish made with ground beef, tomatoes, peppers, and beans. The rich and flavorful sauce is so incredibly delicious! Now, a lot of Texans will say that beans in chili are a major no-no. It’s just not Texas chili if it has beans in it. Well, this Texan likes it with beans and without.One major perk of using beans is that it really helps to stretch a pound of ground beef. We buy grass-fed beef, which is more expensive, so being able to stretch it really helps. 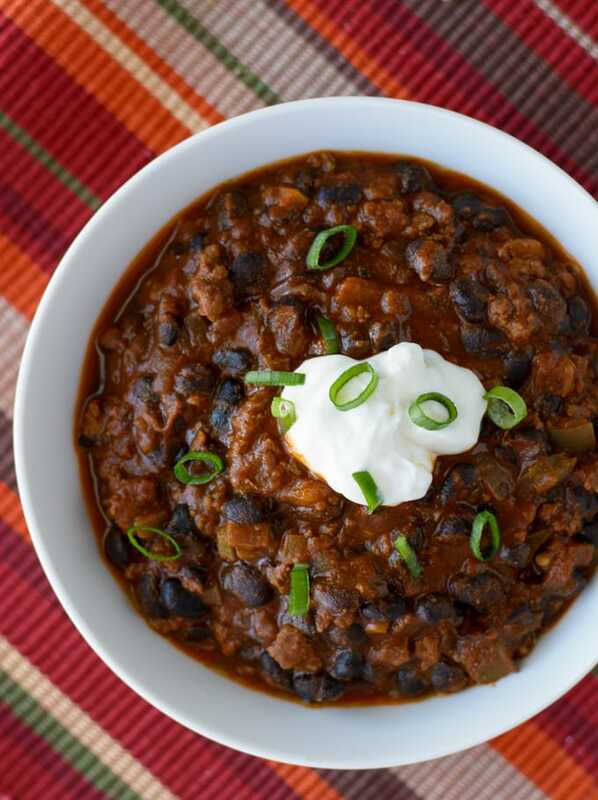 The classic Chili con Carne recipe is slowly simmered for an hour or two. Mine can be on your dinner table in less than an hour from start to finish, but it tastes like it took much longer! 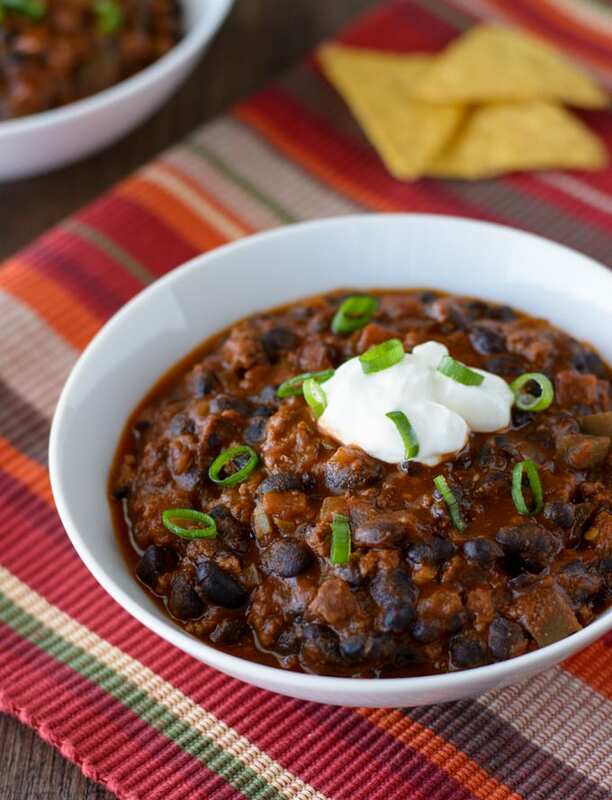 Chili con Carne recipes typically call for pure ground red chile instead of chili powder, which is a blend of spices. You can use that if you prefer, but I’d use way less of the pure ground chili, and you might need to adjust the amount of other spices. I used a mild chili powder for mine. I’ve been buying the Fiesta brand of chili powder lately since I can’t find the Madrecita brand around here anymore. It’s the kind in the little packets hanging with the rest of the Mexican seasonings in lots of grocery stores. If your chili powder is more pungent and spicier, you might want to cut back on the amount you use. Serve Chili con Carne over some plain white rice and top it with some cheddar cheese. It can also be served with some crushed tortilla chips and topped with a dollop of sour cream and scallions. Chili con Carne is a classic Tex-Mex dish featuring a thick, rich and spicy sauce that is so incredibly delicious! Serve it over rice, with crushed tortilla chips or cornbread. In a 4-quart dutch oven or saucepan, heat the oil over medium heat. Add the onions and peppers and cook until softened, about 5 minutes. Add the ground beef and brown the meat, breaking it up with a spoon or spatula as it cooks. Add the garlic, spices and salt and toss to coat the meat and let cook for 1 minute. Pour in the tomato sauce and water. Add the beans and stir to combine. Bring to a boil, reduce heat to medium-low and let simmer, stirring occasionally, until sauce is thickened slightly, about thirty minutes. Serve it over rice or just with your favorite chili toppings. If your chili powder is more pungent and spicier, you might want to cut back on the amount you use in this recipe.